The only cut-off wheels I’ve ever been exposed to are the conventional composite wheels made from the usual suspect materials: Aluminum Oxide, Silicone Carbide, or Ceramics. Standard composite wheels are known for 2 distinct things in my life: they get used up very quickly and they can explode on you without notice if they’re damaged even a little bit. This diamond cut-off wheel from Diablo is said to be “100 times” more long lasting and, since its made from steel, it’s much less likely to blow up on you. The wheel I’m sharing with you today is the Diablo Diamond Metal Cut-Off Blade….objective word: “Diamond”. You probably already know by now that diamond is one of the hardest materials on the planet and is incredibly durable. Diablo has introduced this steel blade with an outer rim coated in small chunks of diamond material for the purpose of cutting through nearly any ferrous material you can throw at it. It can also chew through aluminum quite easily. Diablo claims this wheel will last 100x longer than conventional cut-off wheels. That’s quite a tall statement that I hope to realize fully in the future. For now, I can tell you that the cut quality has not changed since I’ve owned it over the past couple of months using it intermittently on some steel projects. This wheel weighs in at 97g compared to the feathery 40g aluminum-oxide wheels I’ve used in the past. I’ve noticed the difference in the weight of the wheel by how smooth my grinder behaves. The lighter A.O. wheel likes to hop around and “cam-out” of the cut line way more than this blade which is a good thing for me. I also notice that the added mass really helps to soak up vibrations much better than the composite ones. Surprisingly, the kerf of the wheel is actually narrower than my standard wheels I am used to. The Diamond wheel comes in at .058” compared to .065”. This small margin doesn’t mean much to me but it may mean something to someone out there in the ether. For me, conventional cut-off wheels are scary little creatures. They spin their butts off at a ka-gillion RPM (fact), chunk sparks like the 4th of July, and they have an unpleasant tendency to explode under the right conditions. 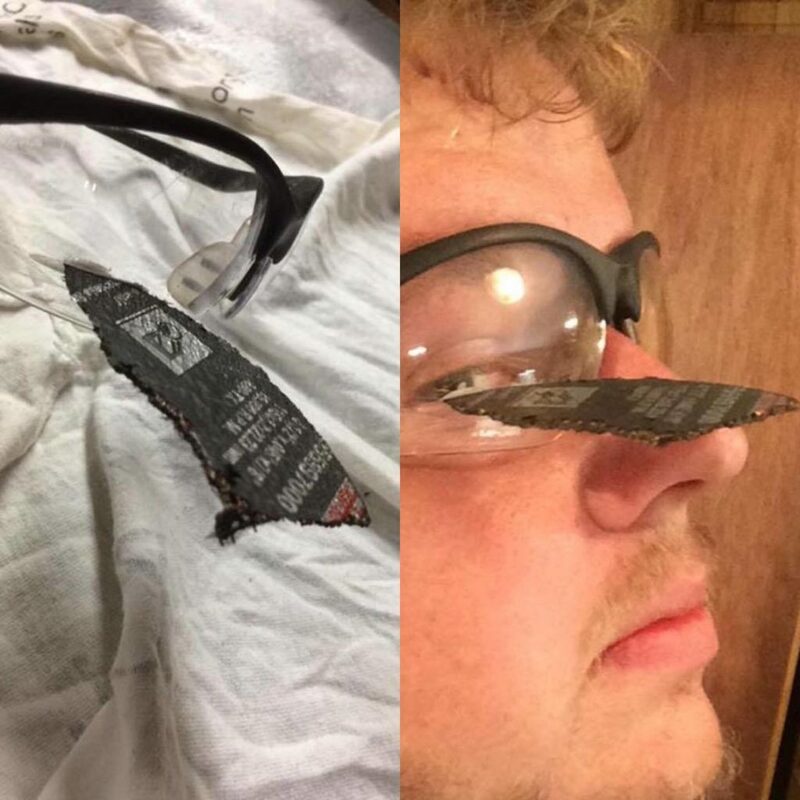 The photo below is one that I found on the internet which shows just how important it is to wear the right protective gear as well as the brittle nature of composite cut-off wheels. How does all that verbiage relate to this wheel? Unlike the hard packed crystal structure of conventional wheels that are prone to cracking and failing catastrophically, this wheel is made from a chunk of steel that is much less likely to fly apart on you. This point alone should resonate very well if you’ve ever been around die or angle grinders very much. If you compare it to other wheels that are on the shelf, you may initially think twice based on the 15 dollar price point compared to the conventional ones at $2.50. But, this wheel not only outlives the conventional wheels, but has more than enough going for it to justify the cost. It’s much less likely to explode (good thing..lol), the additional weight makes it very smooth and controllable, and it doesn’t get smaller as you use it. I thank you for stopping by to learn more about this Diamond Cut-Off Wheel from Diablo. This review was created for The Home Depot ProSpective Campaign. If you are interested in buying one of these diamond wheels feel free to use this link or one above. Theses are affiliate links which offer a small kick-back to me which I use to help fund this webpage and I appreciate the support in this way. Thank you again for dropping by and have a great day.